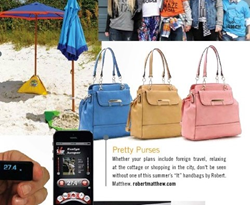 The stylish Robert Matthew Harper Tote has been featured on Ottawa Life Magazine’s July/August issue! The best selling tote has been highlighted as one of the magazine's best picks. Handbags hold a big importance to women and their everyday lives. Each bag also holds a different purpose and just like the old saying – “different bags for different occasions!” A bag that’s both functional and fashionable is must for every woman that has a passion for them! The Harper Tote is an "It" handbag by Robert Matthew. Although not big in appearance, the Harper Tote still has plenty of room for all of her essentials. The center divider of the tote makes it easier to organize and access all of your necessities. The bag features a variety of colors, an adjustable and removable strap, animal friendly faux leather, and a touch of light gold hardware.